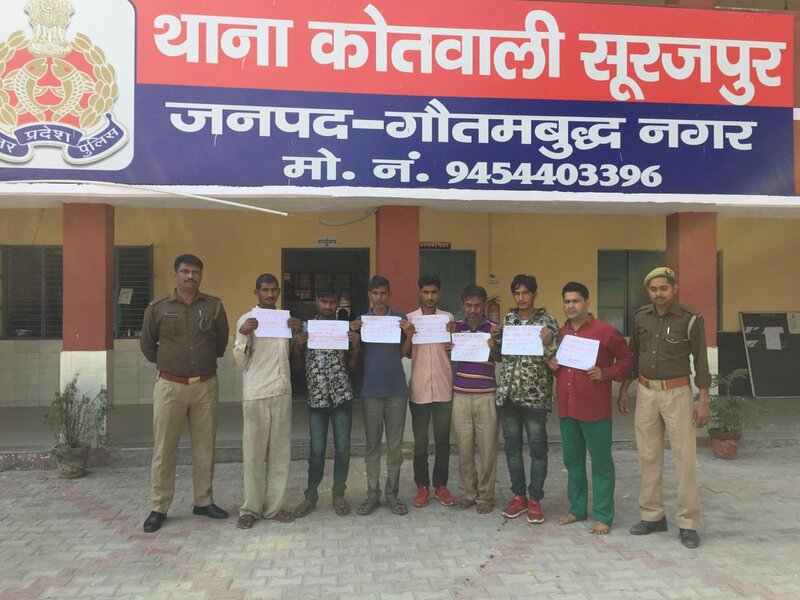 Greater Noida (06/11/18) : Showing alertness Greater Noida Police had arrested seven robbers red handed while they attempting robbery in hotel. The incident is of Surajpur police station. Police conducted the crackdown over a tip they received from a police informer. On 6th November SHO Surajpur Police Station received information that a gang of robbers are attempting robbery in hotel Shine situated on the hotel Crown Plazza Service road. As the hotel shine is vacant from couple of months robbers entered inside the hotel while their two cars are parked outside. As the SHO received the input immediately a police team is rushed to the crime location and the entire gang was nabbed from the spot. Police had recovered four Knifes and a robbed Bolero car that is being used for carrying the looted stuffs. All the arrested accused were identified as Wakil, Faizan , Sabbir, Danish, Sahanshar, Salman and Sanjay. Apart from one member all accused are the resident of Gautam Budh Nagar. All were sent to Jail after being presented before court. Carnival Cinemas in the Heart of Delhi Connaught Place, Reopens today!